CoLab Radio » Blog Archive » Goodbye iPhone GPS. Hello Open Source Transit Planning. Goodbye iPhone GPS. Hello Open Source Transit Planning. I’m an enthusiastic transit rider, especially when I find myself in a new city. For a newcomer, bus and subway systems aren’t always straightforward to understand. So I’ve become a frequent user of transit directions on my phone – getting trip options with time estimates in my hand is, well, handy. With the new version of the operating system coming for iPhones later this year, Apple is dropping built-in support for transit directions. Instead, non-auto trips will be dealt with by separate apps. 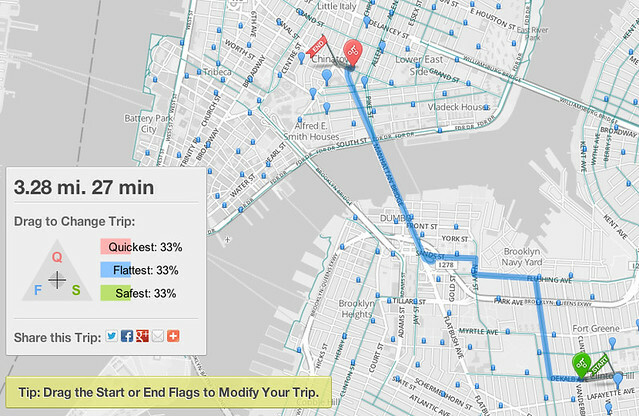 Enter a project we’re working on at OpenPlans: an open source transit planning app. The app will work in all cities. It will use open transit data to provide directions in whatever combination of modes the user prefers – transit, walking, biking, and bikeshare too. To fund the development for this project, we’ve turned to Kickstarter, the crowdfunding-website For people getting around cities, supporting the project helps build an excellent trip planner. But we’re also using the project to tell a story about open data and open source, and exploring new approach to building essential civic infrastructure. Our project is a small part of a growing space of “Kickstarter urbanism” activity. Projects like SpaceHive and MIT alum Jase Wilson’s neighbor.ly go much futher, taking crowdfunding into the new and uncertain territory of funding public goods though online campaigns. Ethan Zuckerman, Director of the MIT Center for Civic Media, captured some of the troubling social implications of this approach last week in his post on the “unanticipated downsides” of treating city parks like products. Zuckerman offers some great ideas about getting crowdfunding right, including a enthusiastic promo of my crush, ioby.org. Ioby depends on a healthy blend of on-the-ground organizing, capacity building, and fundraising for community projects. I suspect we’ll be hearing a lot more about crowdfunding as municipal budgets continue to get tighter. There’s a lot to work out. But in the meantime, if you’re interested in getting around cities, or open civic infrastructure, consider supporting our Kickstarter. Quick note, I don’t believe (though I am privy to no special info) that Apple is dropping the GPS, they are dropping the google maps directions app. The GPS hardware as far as I am aware, will remain. Will, you’re absolutely right, I think the headline is a little confusing. you had me worried for a second! but taking a gps off the iphone would eb a crazy move! I totally welcome more players in the location space and the biking app you picture totally rocks! Ah my fault. I wrote the title and probably some erroneous tweets from @MITCoLab as well. Thanks for your comment, Will. I am a transit planner who works for an agency that is on Google. How can we-our Agency-make sure we’re involved in this project? And will this be easier for us to upload our information to than the mess that’s GTFS? (As a small agency with no IT support, it’s up to me, the transit planner, to upload the info to Google and it’s a nightmare, at best). If you create a (free) account and upload the GTFS using the web-based form, it can then become part of the nationwide map–and you can even use OTP for your own projects (e.g. your agency website, etc.). If for any reason you have trouble, shoot me an E-mail at jmaki@openplans.org and I’ll connect you with the right folks to help you out further. Sometimes it can be the actual format thats hard to make, do you have a couple of validation tools too? That would rock!